For those that don’t know, Satya Nadella is the Chief Executive Officer of Microsoft, and succeeded Steve Ballmer in 2014. 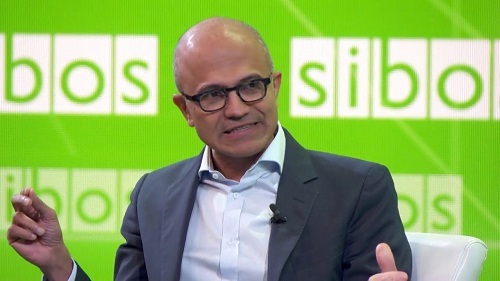 Satya closed Sibos in Toronto last week and following are the 8 key themes that i picked up on from his chat with SWIFT CEO Gottfried Leibbrandt. Interestingly, Gottfried questioned Satya about Microsoft’s purpose. Drawing on SWIFT’s own purpose starting out in 1973 to kill the telex, and Microsoft’s initial mission in 1975 of putting a personal computer in every home and on every desk – Gottfried asked, what now? I must admit i don’t know much about quantum computing, but it was a recurring topic for Satya. Satya is clearly excited by the prospects of quantum computing and described his excitement of how it brings together maths, physics and computer science in a unique way. If like me you know little about Quantum computing, it’s clearly something to brush up on! The frontier as Satya described it, is technology and security. He warned that security is not just about protection but about operational security – i.e. it is an intelligence game and suggested that the core was to continually build updates rather than standalone solutions. There is a need for collective responsibility – giving the example of you can’t get fit by watching others go to the gym!